days. This outstanding story is celebrated by filmmaker Tim VandeSteeg in his documentary "My Run," narrated by Oscar-winning actor Billy Bob Thornton. This isn't a tale of a peak-level Olympian athlete blessed with good genes and top-class coaching. Rather, Hitchcock's story as portrayed in the film is one born out of choosing life after death. His wife passed away from breast cancer, leaving him with three young children and no income. 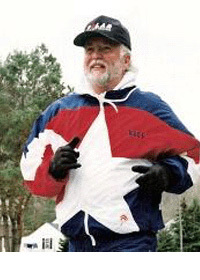 A little more than a decade later, in 1996, Hitchcock began his 75-day run to not only honor his wife, but the struggle of single parents, echoing sentiments of the inspirational running of Canadian Terry Fox in the 1980s. Terry's story special is that after raising his kids, he took it upon himself to make life better for other single parents and kids." 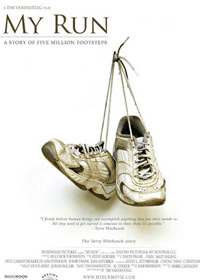 The director and star met through a mutual friend, and after hearing the middle-aged marathoner's story, VandeSteeg joined efforts with producer Mark Castaldo of Destiny Pictures to make the inspirational film. He had discovered a writer on InkTip, Kim Pederson, to help track and highlight the many footsteps of Hitchcock's journey. Running is often thought of as solitary exercise. But based on the reception of “My Run” and in Hitchcock's case, running moved others to join him. "That is why I made this film. I want as many people to see it and be inspired by it the way I was, to learn that with guts and stubbornness, anything can be accomplished, and that with compassion and caring, every individual can make a difference in this world."